WWD announced today that a Karl Lagerfeld Barbie is in the works and set for release later this year. Hope she won’t be too limited of an edition. I will be interested to see the actual doll photos. This entry was posted on July 17, 2014 by raberry65. It was filed under Barbie and was tagged with Karl Lagerfeld Barbie, Mattel, Robert Best, WWD. Thanks for the heads up I would love to see this doll also. 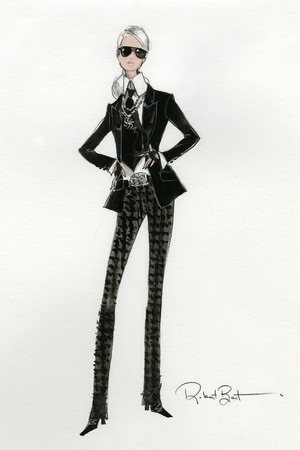 Love Barbie with Karl’s signature silver ponytail and well tailored suit !! She looks like a winner to me! Love this. We need more Barbies in pants. I love her in pants and suits.